After conducting a nationwide search, Baltimore’s arts agency has ultimately promoted one of its own to be its next leader. Donna Drew Sawyer began work on Monday as chief executive officer of the Baltimore Office of Promotion & the Arts, the quasi-public agency that serves as the city’s arts council, events center and film office. A New York native, Sawyer joined the agency last year as chief of external affairs. Sawyer’s appointment was announced yesterday, more than 13 months after former CEO Bill Gilmore disclosed that he was stepping down after 37 years with BOPA and its predecessor organizations. “Donna has a strong diverse history in arts leadership, solid marketing and business acumen and a fierce commitment to equity and collaboration,” search committee chair Anana Kambon said in a statement. Sawyer is starting her new job less than two weeks before one of the biggest events BOPA puts on every year, the three-day Artscape festival, which runs this year from July 20 to 22. She will lead an agency with an annual budget of nearly $12 million and a full-time staff of around 50. Some staffers had expressed frustration that the agency was taking so long to announce who would succeed Gilmore, who left BOPA on good terms in December. 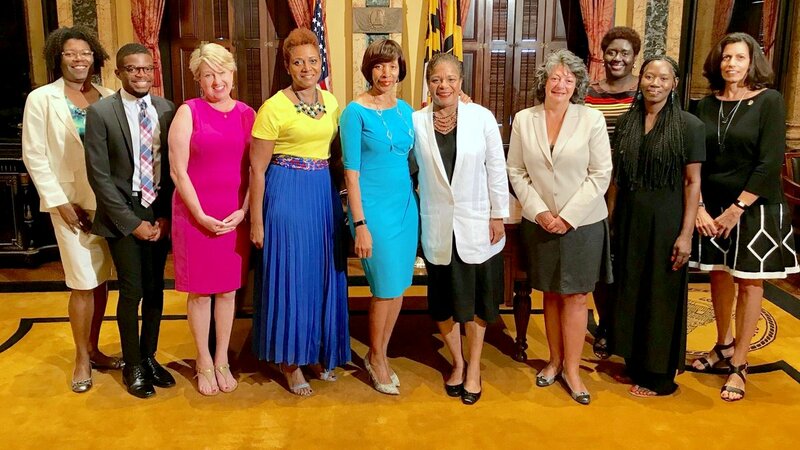 There were concerns, described last month in The Brew, that Mayor Catherine Pugh had wanted to select Gilmore’s successor and was miffed when she learned she did not have the authority to do so. Because BOPA is a non-profit with its own board of directors, it has a separate process for choosing its top executive. But with the city of Baltimore providing the largest single source of funds for BOPA, the mayor has a say in that process, even though he or she can’t unilaterally name its leader. Sawyer was chosen by a search committee made up of BOPA board members Kambon, Paula Rome and Sandra Hillman, and four other representatives of Baltimore’s arts community, Leslie King Hammond, Jeffrey Kent, Jed Dietz and Clair Zamoiski Segal. According to BOPA, Sawyer was the search committee’s unanimous choice. Part of what appealed to the committee about Sawyer is that she has a history of being both an artist and an arts administrator, members said. Before joining BOPA, she held senior positions in the arts and non-profits sector, including the Smithsonian’s Hirshhorn Museum and Sculpture Garden, the Arts and Science Council of Charlotte-Mecklenburg and the Chrysler Museum of Art in Norfolk. She served on the arts commission in Norfolk, Virginia, and helped launch the Virginia Waterfront Arts Festival and has served on art panels for the National Endowment for the Arts and on the YWCA Board of Directors. Sawyer also has held senior advertising, marketing and promotion positions with Young & Rubicam Advertising and AT&T International. Her first novel “Provenance” won the 2017 Maryland Writers’ Association Award for Historical Fiction. She and her husband, Bowie State University professor Granville M. Sawyer Jr. live in Bolton Hill and have two grown daughters. Sawyer said yesterday that she joined BOPA last year primarily because of Gilmore, not knowing that he would step down several months later. Sawyer said she applied for the job last fall, after the search committee was formed, and wasn’t frustrated by the long wait for a decision. The new CEO wouldn’t give her age or say how much she is making. But she said she didn’t pursue the job as a stepping stone to something else. Does she see herself serving under seven different mayors, as Gilmore did?